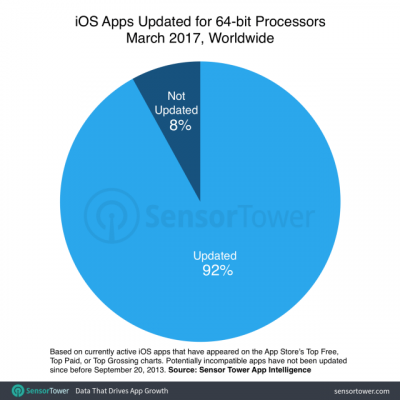 According to the latest report from Sensor Tower, iOS 11 may stop supporting about 200,000 32-bit apps that aren’t yet updated with the support for 64-bit processors. Currently, when users try to open such apps on their iPhones or iPads running iOS 10.3 beta, they see a warning saying “This app will not work with future versions of iOS. The developer of this app needs to update it to improve its compatibility.” Looks like all these apps won’t be supported at all after the update to iOS 11. Sensor Tower has analysed the app intelligence data and determined that there’re 187,000 apps on the App Store that won’t work in iOS 11 unless their developers add the support for 64-bit architecture. In other words, that’s about 8% out of all existing apps. Apple is expected to unveil iOS 11 at the Worldwide Developers Conference in June. Most likely, the new firmware version won’t work on iPhone 5 and older devices.